Each of us is only here thanks to the collective efforts of those who came before us—people who, despite lack of wealth or power or title, kept pushing forward, doing their part to bend the arc of history towards prosperity, equality, and justice. I don't know about you, but I for one am still living in deep denial that the Obamas are no longer living in the White House. I mean just look at them. They're gazing into the sky in the same way I gaze at them... ANYWAY. When I found out the first Obama Foundation Summit was to be held in Chicago on October 31st and November 1st, and that artists, entrepreneur, organisers and civil servants from around the world could apply for tickets to gather and share their ideas and optimisms around change and moving forward, I gave it a try. So we applied, along with thousands upon thousands of other people (which in itself is a great thing), here at Strong Women Squad but even though we didn't get the coveted tickets we can all still watch some of the fantastic speakers, and learn from them, right here from our own living room. Although, maaaaaaaan, it would have been amazing to be in the same room as Michelle and Barack! Michelle is SO Strong Women Squad. President Obama says in his welcome message on the website, "We created this Summit for you—to share your ideas, sharpen your skills, formulate big plans, and create lasting relationships. And it’s just the beginning. 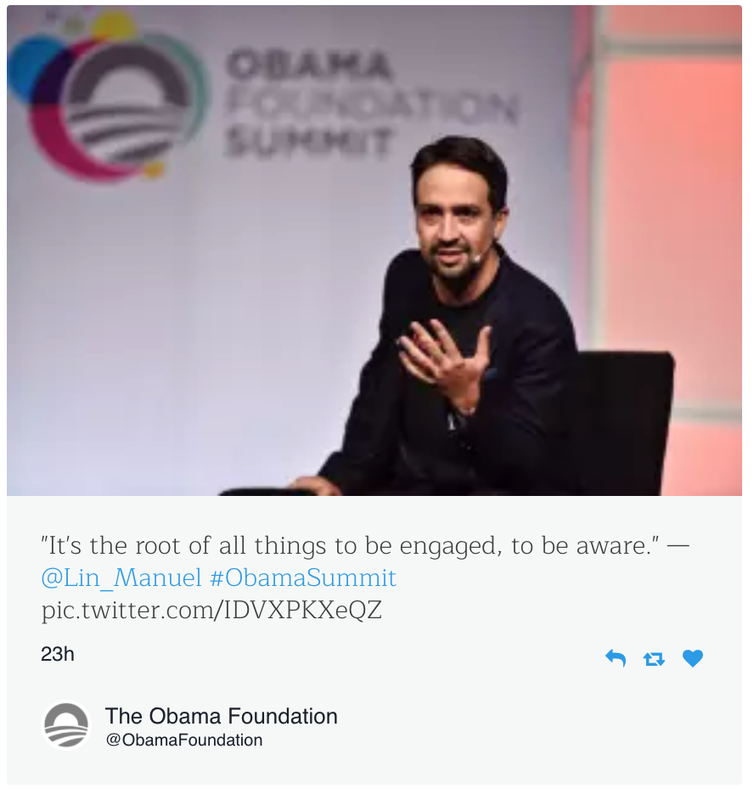 The Obama Foundation will seek to inspire people everywhere to give back, get involved, and recognise that they, too, have the power to make a difference." Here are some of the highlights for you, below, but be sure to check out the website in the link above for more ways to inspire, empower and connect the next generation of leaders. In a conversation with poet Elizabeth Alexander, Mrs. Obama will discuss her sources of inspiration and what it takes to live a life of public service. Prince Harry joins Mellody Hobson in a conversation on ways that youth can be the drivers of community engagement and development. "What we're trying to do is build a sustained movement that will ensure that we really can have a gender equal society - not ten years from now, not five years from now, but today." "What I witnessed during the storm was something that I wish we could see in each other all the time. Just jump in to solve problems together without a storm as the catalyst. Imagine what we could accomplish together." "Harassment is such an isolating experience and we wanted to show people that there were other people out there that were going through what they were going through and that we had their back."